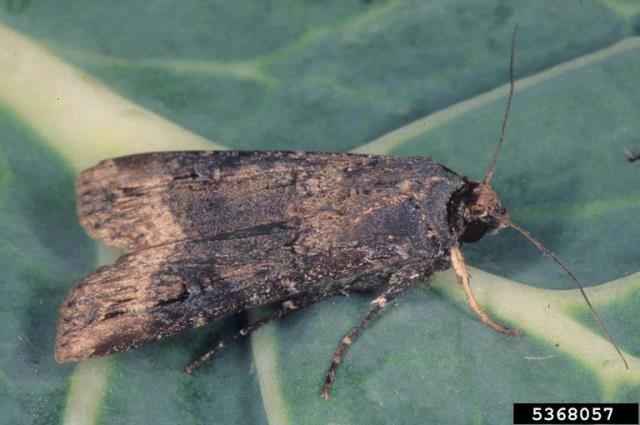 Black cutworm is the most common of the many cutworm species that damage corn in New England. Adults are night-flying tan and black moths, while the caterpillars are dark-grey to black and up to 2" in length. Moths from the South arrive between March and June. Eggs are laid mostly on grasses and winter annual weeds, usually near areas of the field prone to flooding. Certain fields tend to have a history of repeated cutworm damage. The larvae feed after dark while hiding under the soil surface during the day. There are 2 to 3 generations per year but usually only the first generation, which produces larvae in May and June,damages corn. 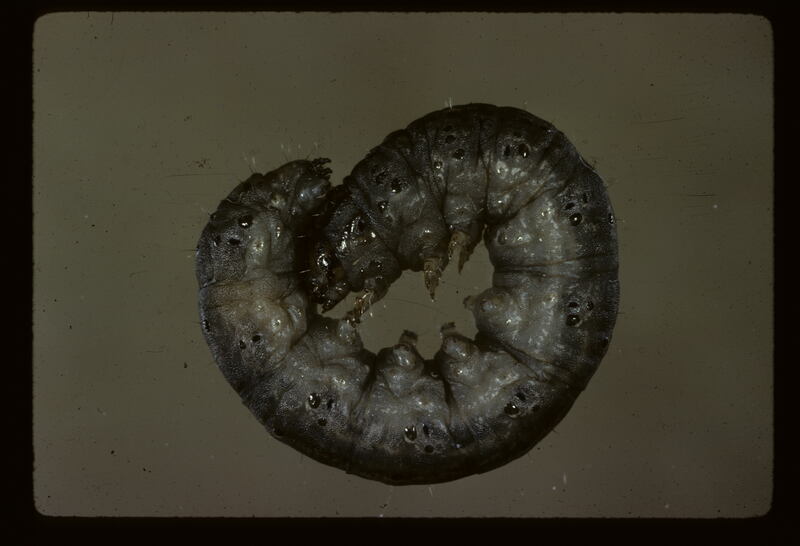 Small larvae feed on leaves and occasionally larger larvae cut seedlings off near the soil line. Adults can be monitored with a yellow and white Unitrap from March through May. A catch of over 40 moths before June indicates that frequent spring and early summer scouting is prudent. Scout problem fields weekly, checking at least 100 plants for leaf feeding and cut stems, especially near field margins. When corn follows sod/hay in rotation, fall plowing may lower cutworm populations by reducing spring egg-laying sites. Spot spray heavily hit areas or edges of the field if 5% of the plants have been cut down. For best results, make application between midnight and dawn while cutworms are feeding aboveground. Foliar-applied rescue treatments are recommended over preventative soil applied insecticides.